The Minolta Hi-Matic 7S is a pretty hefty camera (in more than one way!) that Minolta made in the late sixties. The era of rangefinders was drawing to an end, the Single Lens Reflex camera was the new magic moneymaker for the industry. 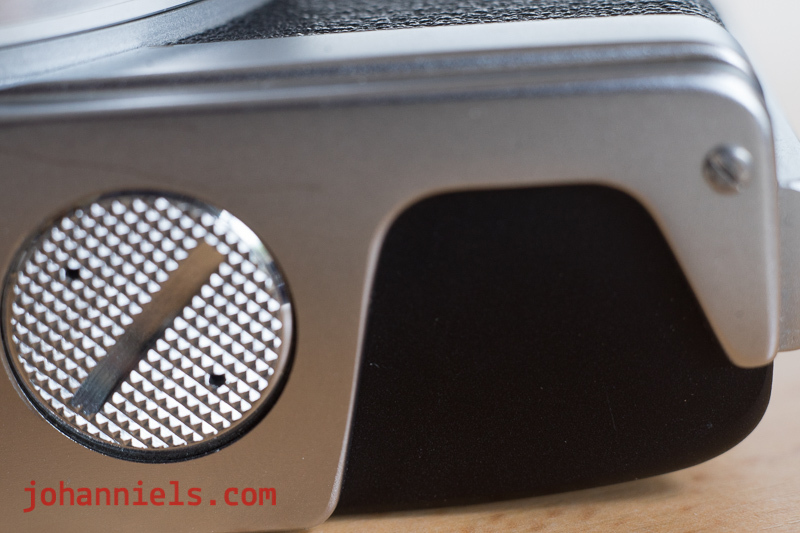 But, towards the end of the rangefinder era for Japanese manufacturers, there were some models that were at the pinnacle of what the designers and manufacturers were able to come up with, and build quality was still a prime aspect of a good camera. That was a recipe for a fine result and some manufacturers came up with pretty impressive models. The Minolta Hi-Matic was no different. Or was it? First of all it's a fully metal camera, hence the weight. There was no skimping on build quality anywhere. And to me that's a big plus since I really hate flimsy cameras. I don't mind a big camera, I'm quite ham fisted and this Minolta rangefinder camera matches my hands perfectly. Plus, I need a workout to shed some surplus weight anyway, so why not lug the Hi-Matic 7S around for the day when I go out... haha! Second, I really like the parallax-corrected viewfinder with the blueish tinge and the yellow rangefinder patch a lot. Those two colours provide natural contrast, easy to see the focus patch that way. Although mine could do with a light clean of the window's insides, since it's a bit hazy. So far, it's not urgent though. Third, that's a 45mm 1.8 Rokkor-PF lens you're looking at. While a true 'normal' lens would be 43mm focal length (since that's the diagonal of the 35mm film frame), most brands opted for a 50mm or even 55mm normal lens in the 1960s and 1970s. Not Minolta, who opted for 45mm normal lenses well into the 1980s when they still supplied them with the excellent X700 SLR flagship. The story goes that the closer lenses are to the ideal focal length of 43mm, the more natural their images look since they approach our natural width of sight more. 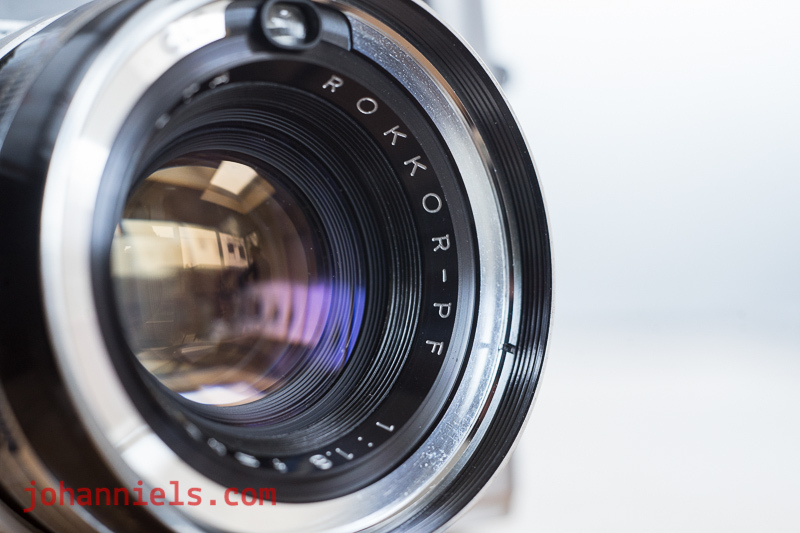 Whether that's true or not, the 45mm Rokkor-PF lens is very well coated and very well corrected, even wide open. Images are crisp and evenly exposed. The Exposure Value System, is it a drawback? The camera shows Exposure Values in the viewfinder window. What's up with that? Exposure Values are a horrible system to most people right? And doesn't EV force you to check the values against the pesky locked-in combination of shutter speed and aperture a lot? Well, yes and no. The EV system would be pretty obnoxious to use when you want to shoot aperture priority and the camera does not have a separate mode for that, but the Hi-Matic 7S is an all-in-one camera, much to my surprise! Have a look at the image below! The Minolta Hi-Matic 7S can do all four exposure options! Pretty remarkable! So, is the EV setting that the viewfinder displays totally useless then? Well, no! 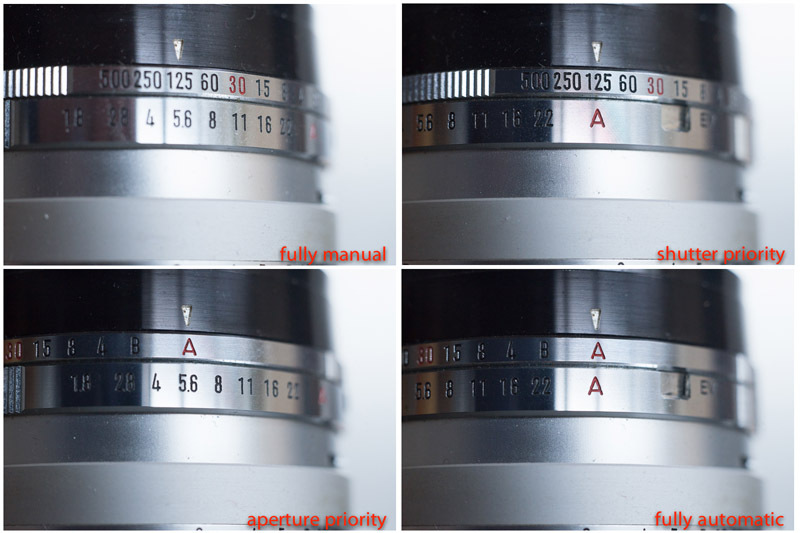 Whenever I load the camera with film, I set the film speed notch on the bottom of the lens to the correct value. For instance, I expose Rollei Retro 400S film at 250 ASA. The widest aperture on the camera is 1.8 and often, I'm fine with that. The slowest speed I can use on the static object, is 1/8th of a second, since the camera has a leaf shutter that does not cause any shutter slap. This results in an Exposure Value of 6. That number is all I need to remember now for as long as the film is in the camera. Once the meter passed the number 6 in the viewfinder's exposure scale, I'm good to go. I can now set the shutter to A or the aperture, or even both. Or set my speed and aperture manually. As long as the EV is above 6, I'm good. Each of those results in an EV number that I need to memorise and that's it! Other writers online have pointed out that the Minolta Hi-Matic 7S has a very long film transport stroke, up to 220 degrees rotary! And yes luckily you can ratchet the transport crank, several short cranks also get the job done. Pfew! 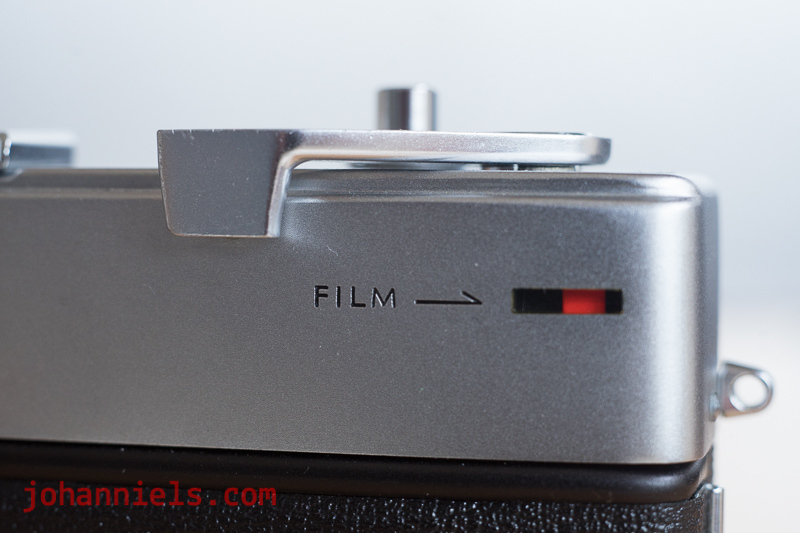 But strangely, nobody online has pointed out yet that the focus throw on the Minolta Hi-Matic 7S is extremely short. To me, that is a big deal! 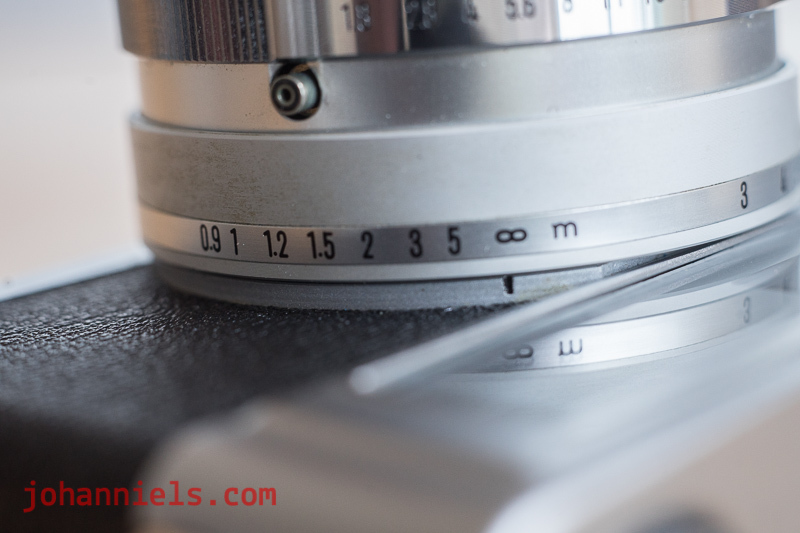 It means the camera can be focused very quickly, no need for a long travel when focusing the rangefinder patch. Just how short it is? Well, the full focus throw is only 45 degrees! from infinity to 0.9 meters (3 feet) is only an eighth of a full circle and you're done! Very useful for street photography and quick response photography, I'd say. The Hi-Matic 7S is truly remarkable! All in all it's a remarkably complete camera and they aren't even that expensive! Just how remarkable? Seems this Minolta Hi-Matic 7S was the only rangefinder ever made that can do all four exposure modes! And, not even mentioned yet apart from a brief remark in the rundown at the top of the article: this camera syncs the flash at all speeds from 1/4th to 1/500th of a second, since it's got a leaf shutter. That means, fill flash in daylight is possible with this baby, especially when you get a strobist flash that you can manually reduce output on! I say, you better get one now cause now that the word is out, they might get scooped up pretty quick... I'm getting an extra one!